Emma Vaneecloo is the Structural Designer and a Managing Designer/Entertainer. Emma is an artist through and through. She has spent her life in circus and dance schools and has traveled the world as a performer. She is also one of the three main twisters here at Twisted Designs. 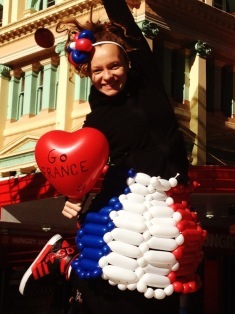 Emma comes from Paris, France and is now building a life for herself here in Brisbane. Paris is one of the most culturaly rich cities for the Arts in the world. Emma brings a bit of that culture with her offering it to you here in South East Queensland.